The city of Pittsburgh expects a wave of development as plans for a bus rapid transit line through Uptown move forward. Real estate agent Helen Perilloux has lived in Pittsburgh’s Uptown neighborhood for nine years, and says off the top of her head, she can think of about 30 buildings that have been demolished in that time. Only one has been replaced with a new structure, she told Pittsburgh City Council President Bruce Kraus and members of the City Planning Department at a public hearing Tuesday. Tuesday’s public hearing concerned a proposed Interim Planning Overlay District, or IPOD, for Uptown. 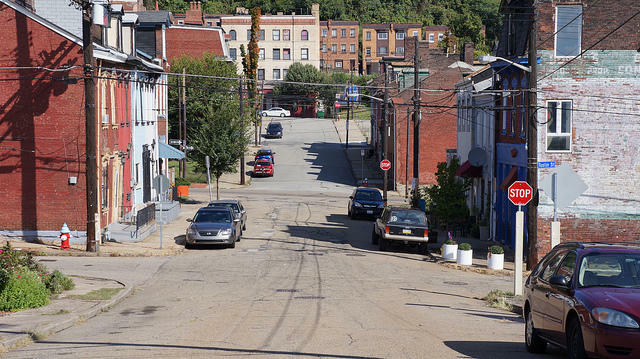 The designation would put tighter controls on any building and demolition in the area, ahead of a wave of development expected to occur when the Port Authority of Allegheny County runs a bus rapid transit line through Uptown from Oakland to downtown. Justin Miller, senior planner with the city of Pittsburgh, said construction projects would also face increased public scrutiny during the 18-month IPOD period. The goal is to put the brakes on the trend of building demolition and the establishment of surface parking lots while the city figures out how best to manage the proposed “eco-innovation” district slated for Uptown. The plans are a key part of the city’s P4 Initiative, which prioritizes performance, place, planet and people in development projects. City Planning Director Ray Gastil told City Council in April that they want to take a district-wide approach to issues such as stormwater management, energy, and transportation. About half a dozen Uptown residents spoke at Tuesday’s hearing, and all were supportive of the city’s plans. Some residents had even taken it upon themselves to begin rehabilitating the hillsides. “We are working with the watershed and the natural eco-system up there, how the hillside is setup, we are actually reinforcing the infrastructure for soil retention, to retain the hillside so it doesn’t come down,” said horticulturalist Dennis Raspanti. Resident Don Johnson said Uptown community members are advocating for specific initiatives that would fit within the city’s eco-innovation theme. “We’ve come up with a very lengthy list of sustainability-minded projects, involving urban farms, community gardens, food forests, and we also have plans to control the water flow and set up irrigation systems and establish animal habitats,” Johnson said. James Noschese spoke on behalf of the Pittsburgh Association for the Deaf, which is located on Forbes Avenue, and said he wanted to make sure that plenty of parking spaces remained nearby for the organization’s 320 members. Pittsburgh City Council is slated to discuss the IPOD proposal at their committee meeting next Wednesday. On Tuesday, the city of Pittsburgh and the Port Authority of Allegheny County held the first of two public meetings to gather input on the proposed Forbes-Fifth Corridor. About a hundred people attended the meeting to listen and share thoughts on the potential transportation infrastructure in the 5th/Forbes Corridor which links Downtown to Oakland, running through Uptown and part of the Hill District.